Update (10/5/18): WSDOT has discovered there might have been an issue with the pavement where the accident occurred. Their tests showed the concrete surface in one lane "shows a subsequent reduction in skid resistance." According to KOMO4 News, road crews will grind the surface to increase friction and add traction between mile posts 88 and 90, starting next week. 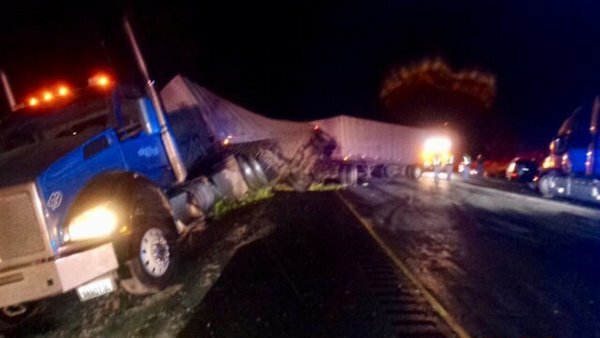 A massive pileup crash involving five semi trucks and three other cars shut down westbound Interstate 90 near Cle Elum on Monday night, according to the Washington State Patrol. The incident occurred at 8:15 p.m. about two miles east of Cle Elum at milepost 87. State Patrol says a semi truck heading west on I-90 lost control and jackknifed, coming to rest in the right shoulder. A second semi tried to avoid the first truck and lost control, coming to rest in the left shoulder. Two other cars then pulled off on the right shoulder for the crash. Then, a third semi with double trailers attempted to go between the two crashed semis and struck the two parked cars. Another car then crashed into one of the parked cars. Finally, two more semis approached the crash scene side-by-side and couldn't stop as they tried to fit between the first two semi trucks. The two trucks ended up colliding with each other. Only one minor injury was recorded. The westbound lanes of I-90 were shut down for six hours. State Patrol says the first semi driver, a 26-year-old Kent man, was cited for driving too fast for conditions. Every collision involving a semi truck or commercial vehicle can be a disaster for a victim and their family. Not only are the resulting injuries and damages often high, but the trucking company will typically dispute liability and make the civil legal process difficult to navigate. But when two or more trucks contribute toward the crash, things can get even more complex. Even when the facts are on the victim’s side, the trucking companies involved in the wreck will still do everything in their power to avoid taking the blame. It’s not impossible to win one of these cases. It just takes the skills and experience of a veteran truck accident lawyer. While it may seem far-fetched to pin the cause of your injuries on the responsible parties, with the right tools it is possible. The right semi truck attorney will do everything in their power to establish fault, including hiring accident reconstructionists and other experts to prove their client’s claims to compensation. How do I Find the Right Semi Truck Accident Attorney? "The fallout from a semi-truck accident makes recovering damages more important. The serious nature of these events requires a semi-truck accident lawyer with the experience, knowledge and confidence to combat the trucking company and its lawyers. Here are several tips for picking the right attorney for your semi-truck case." No matter the circumstances of your truck accident, it’s crucial that you act quickly. By hiring an attorney right after the crash, you will have the best chance to secure maximum compensation for your injuries. A lawyer knows that evidence can fade fast. And the other people involved in the accident will hire lawyers to protect their interests. You should have someone on your side looking out for well-being. If you have been involved in an accident involving multiple commercial vehicles, contact Davis Law Group. Our attorneys can assess your situation, and we can advise you on any steps you need to take to protect your legal rights. To speak with a Washington state trucking accident lawyer about your case, call (206) 727-4000 today for your free case evaluation. Our Seattle-based law firm handles cases across Washington.